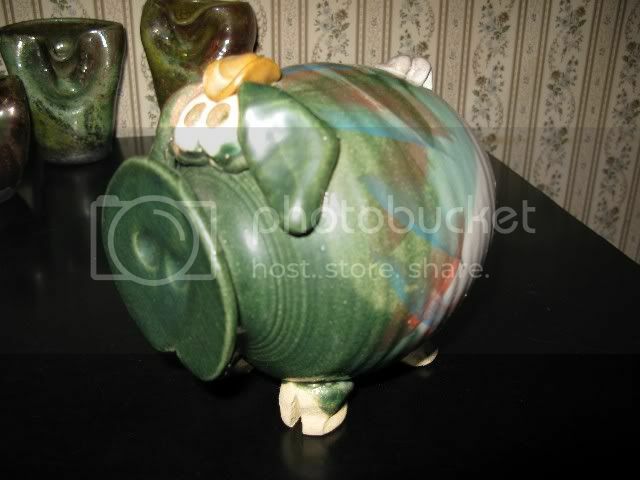 Here is one of Mom's piggy banks! She made several of them. This is one of the larger ones. You can't really see it but there is a small slot at the top. I agree with Jess. Those small building blocks, and the figures are probably worth a great deal of money. in being used, and cared for. I also love the fact you have so many nic nacs and memories. So, get your camera out, put some fresh batteries in it and start shooting! I hope other members will take some pictures too. Mom loved working with clay. She was even thinking about investing in a kiln but then she got sick. After she died we gave her potter's wheel to one of her friends in her class. She would always be the first to confess she wasn't any good at it, but I always thought she was quite talented. She got much better at it as the time progressed. 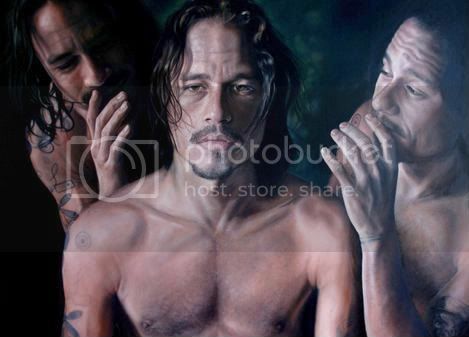 I will take some more pictures of her work and post them here. Maybe you can take some pictures of the things around your house that bring back special memories for you? I'd love to see them! David, this glassware is lovely! Mom enjoyed making ceramics. She took pottery classes at the local art center up until the year she died. She made this little frog and I think he's cute. He really doesn't serve much of a purpose though. He just sits on the coffee table. I suppose he could be used as a paper weight perhaps. I love the little smile on his face! Mom made a lot of frogs! She loved frogs. She also made a lot of cute piggy banks. I will take a picture of one of them. She even made a little teapot. I took a picture of it and posted it over in the "Do you like tea" thread. My grandma made ceramics, too, but she didn't make things on her own, like your mother. Mostly grandma made stuff from molds, but she even had her own kiln to fire things. She made lots of Christmas stuff. I have the Nativity set she made, and also a small ceramic Christmas tree, and a sit of figures in Victorian costume singing Christmas carols. 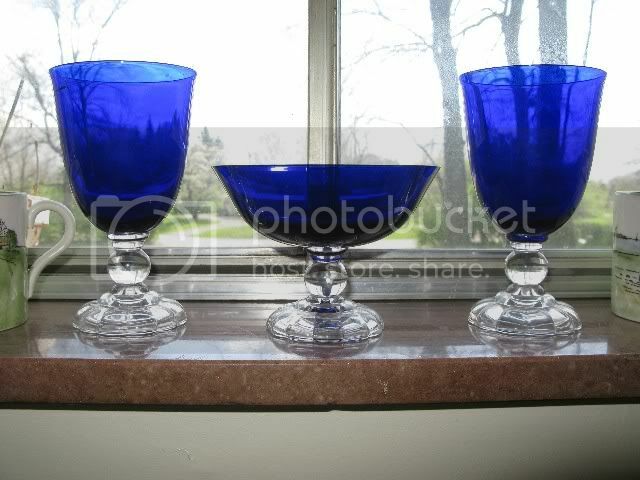 I love the cobalt blue glassware too Jeff. As you can see in the picture I have a few pieces sitting in the sill. When the sun shines through the glass it lights it up and throws the blue color across the floor. I hope I can find the ruby red glassware too. It's also very pretty. If I remember correctly the red glassware is the same pattern as the cobalt. I love your mother's frog and piggy bank, David. This is one of my most treasured possessions, even though it is just a humble teacup, saucer and plate set, of little monetary value. On the back of each piece is a crown with the words “Salisbury Bone China – Made in England” along with some handwritten numbers. It is on permanent display in my living room. It was given as a gift to my mother by my brother, Robert, in the 1950s. I can’t remember a time when Mum didn’t have her breakfast tea and toast from this set. She always had two cups of tea and one piece of toast each morning. Never more and never less. The gilt has worn away in places but there is not a chip on any of the pieces, even though they were washed every day over a period of some forty years. Kerry! That is absolutely beautiful!! I love the colors. OMG, that is so sweet how you still have it. I'm sure it is something you will always treasure since it was something so personal for your Mom. I love things like this. The fact that your Mom used it every day makes it even more beautiful. I think the stories are just as important as the items themselves, don't you agree? Thanks for posting it Kerry! 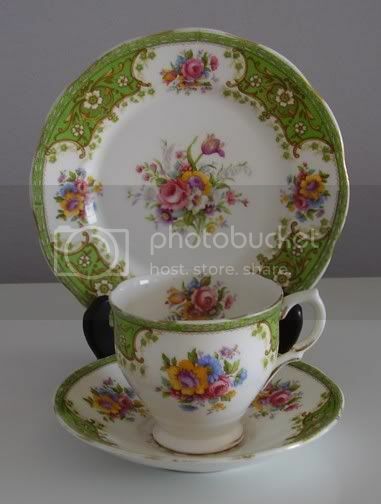 I came across some china saucers and cups with a very similar pattern to your set. I will take a picture of it. There's really not a story behind it though, at least not that I'm aware of. And I like yours miuch better. Yours is more colorful and it has your Mom's energy in it. I will take a picture of it so you can see it.